RC Simulation 2.0 is a fun radio controlled vehicle simulation developed by devotid. It give users the thrill of today’s High Tech Radio Controlled Cars, Boats, Planes and Quadcopters on any of the user created track, maps, venues. Fly some quadcopters, Pilot an RC Jet Liner or go on a RC Rubicon with your Rock Crawler. Drive all kinds of RC Cars, Boats, Rock Crawlers, Planes or Quadcopters on any of the 250+ Workshop Tracks. 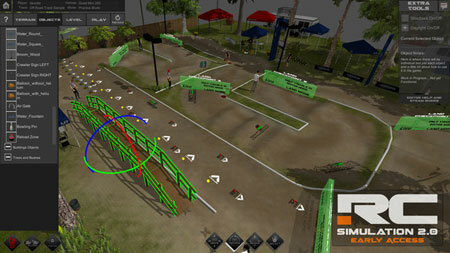 The game includes an in-game Track Editor and Vehicle Painter to create tons of scenarios and Paint schemes. The game features 26 default RC Vehicles. You could switch 8 Camera Views Per Track, Facility including FPV animated mode, Driverstand, Onboard, Follow, Rotate and Blimp Cams. If you get stuck in the game, check out the video walkthrough and gameplay for the game. This entry was posted in PC Games, Walkthrough and tagged RC Simulation 2.0 Cheats, RC Simulation 2.0 Game, RC Simulation 2.0 Gameplay, RC Simulation 2.0 Guide, RC Simulation 2.0 Hints, RC Simulation 2.0 Review, RC Simulation 2.0 Solutions, RC Simulation 2.0 Strategy, RC Simulation 2.0 Tips, RC Simulation 2.0 Walkthrough by Marvin. Bookmark the permalink.